Only King Brand® ColdCure® gel packs contain our unique XC RigiGel® formula. XC RigiGel® is soft to the touch but doesn't move around under pressure. This means it stays in place to treat your ankle, so you get an even and consistent cold treatment over the entire injured area, every time. No matter how hard you press on the gel, it stays in place. It will give a bit for comfort, but it won't move away from your painful injury. Keeping the cold on your injured ankle throughout treatment is very important if you want to relieve the pain as quickly as possible. Unlike traditional blue ice packs, our XC RigiGel® formula does not move to other parts of the pack, even when put under heavy pressure for long periods of time. Keeping the pressure and cold on the injured area of your ankle is critical for effective relief of pain and swelling. In terms of flex and form, XC RigiGel® packs feel exactly the same at room temperature as they do straight out of the freezer. They're firm yet flexible at any temperature for the most comfortable treatments possible. The Walgreens factory tested our gel and found that pound for pound, our gel held over 3x more cold as the best gel they had to offer. The results were staggering. Not only do XC RigiGel® packs hold more cold, they also cover a larger area and contain more gel than standard cold packs. This makes a huge difference in the treatment you receive. Most traditional cold packs only contain a little bit of gel, because a gel pack with tons of gel is a lot more expensive to make. But if you really want to feel better and reduce your pain and swelling, a gel pack with tons of gel is exactly what you need. XC RigiGel® packs are the ultimate solution. A bigger pack with more gel inside means faster and more effective relief of your pain and swelling. 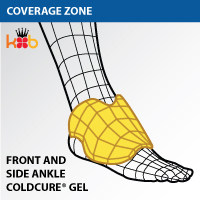 ColdCure® Ankle & Achilles Wraps each come included with 3 gel packs. This makes it easy for you to swap the gels in and out quickly to keep your therapy going. ColdCure® gel packs are large enough to cover your injury, but are never bulky. For example, our Achilles Wrap comes with 3 gel packs that weigh about 4lbs, and that's just the gel packs alone. Compare that to most other ice packs or cold wraps on the market that weigh less than 1 lb, including the wrap. 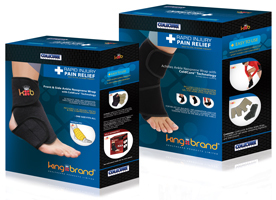 In many cases, King Brand® Wraps contain 10x more gel than other Ankle Wraps. That means maximum relief of pain and swelling and an overall superior treatment. We have 2 different ColdCure® Ankle Wraps that are designed for your specific ankle injuries and conditions. Each one targets a different area of your ankle to provide you with the best treatment possible. The Achilles Wrap covers the back of your ankle and is designed to treat Achilles Tendonitis and other Achilles Tendon Injuries. The Wrap molds the gel pack all the way up the back of your ankle to target your Achilles and ensure there is an even distribution of cooling power over the injured area. The Ankle Wrap covers the front and sides of your ankle and is designed to treat Ankle Sprains, Peroneal Tendonitis, Tibialis Anterior Tendonitis, and Extensor Tendonitis. The Wrap and gel pack are custom designed to mold around the top and down both sides of your ankle for maximum coverage of your injury. If you're unsure about which Ankle Wrap is right for you, please feel free to contact us. One of our knowledgeable King Brand® Advisors can help you. 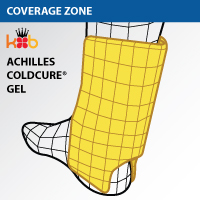 The ColdCure® Achilles & Ankle Wraps provide firm, even compression for superior treatment of pain and swelling. The wrap applies targeted compression to the injured area with no gaps in pressure. To be as effective as possible, the compression needs to be uniform and complete, and the ColdCure® Achilles & Ankle Wraps provide exactly that. 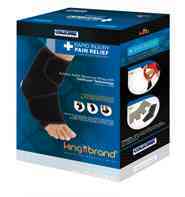 The Ankle Wraps are soft and stretchy, making them easy to apply and adjust. Both the wrap and the gel packs are specially designed for the shape of your ankle. The wrap can be worn without the gel inside as a support for your injury when you're not receiving treatments. The wraps are incredibly comfortable to wear. Most people think that RICE - Rest, Ice, Compression & Elevation - is the formula to follow when treating a soft tissue injury. The truth is that temperatures below freezing can be too cold to effectively relieve pain and swelling. And these temperatures can also be dangerous. Ice can actually freeze your skin and numb your nerves, causing 'cold burns' and even permanent damage to your underlying tissue. The proper solution is RCCE® - Rest, Cold, Compression & Elevation. We don't want to apply ice, we want to apply cold that is just above freezing. Yes, you want cold - and lots of it - but not so cold that it is below the freezing point of water. Ice pack injuries are so common, there are actually law firms that specialize in representing people who suffer from them. XC Gel® packs stay in the safe, effective zone of 0°C. While ice and blue gel packs will rapidly rise in temperature, our gel packs go to 0°C quickly and stay there for a long time. While we recommend that you store them in the freezer, you can store the XC Gel® packs in the fridge if you prefer them to be less cold. For optimum usage, keep one of the packs in the freezer and the other 2 in the fridge and you will get hours of non-stop cold therapy to take away your pain. 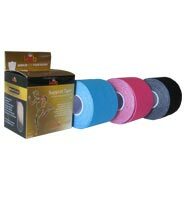 KB Support Tape provides your injured ankle with extra support and protection. This helps to prevent re-injury. It also works to relieve your compression throughout the day. Wear it between your ColdCure® treatments and during physical activity. KB Support Tape comes in 2 different styles: Pre-Cut Strips and a Continuous Roll. These 2 styles also come in 4 different colours: Pink, Blue, Black & Beige. There's no functional difference between the colors, they just allow you to express your personal style. The Pre-Cut Strips of KB Support Tape are perfect for you if you want to use your tape on-the-go. Since they're already cut into ready-to-use strips, you can just apply and go! Each roll of Pre-Cut Support Tape contains 20 individual strips. Each Pre-Cut Strip is 2 inches wide and 10 inches long. The Continuous Rolls of KB Support Tape are ideal for you if you're looking for a more customizable Tape. You can cut the Tape into a variety of different shapes and sizes to achieve a completely unique application for your ankle injury. Each box contains 1 Continuous Roll of KB Support Tape that is 2 inches wide and 16 feet long. The above application is for Achilles Tendonitis. The application that's right for you will depend on the type of ankle injury you have and the location. We encourage you to try different applications for your specific ankle injury to find the one that's right for you. Use the pain as a guide. If you feel the pain in a specific area of your ankle, apply the tape there. 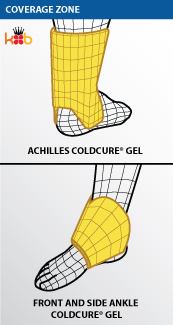 Our ColdCure® Achilles & Ankle Wraps fit better, last longer, stay colder, work faster, target pain better, and are made of ultra-safe materials. You can be sure that a King Brand® cold compression wrap with ColdCure® technology is far more effective than any other product on the market in many, many ways. Start feeling better today. King Brand® ColdCure® and BFST® products are FDA Registered medical devices. They have also passed the Health Canada, ISO 13485, ISO 10993 and IEC 60601-1 3rd Edition approval processes. These are not simple consumer goods. These medical grade devices are intended to prevent, treat and cure soft tissue injuries and chronic conditions. Part of being an FDA Registered company means that our products are made from high quality, biocompatible materials. These devices are manufactured and tested to the highest safety standards in the industry. Note from KB WebMaster - The text below is primarily intended to assist with Google properly classifying this page content. To learn more about our products please visit our website.<br>Ankle ice packs can be used to treat achilles tendonitis, achilles tendinosis, achilles tenosynovitis, sprained ankles, tibialis anterior tendonitis, peroneal tendonitis and extensor tendonitis. ColdCure is the best ice pack money can buy. Ordinary ice packs are not as good as a ColdCure ice pack. Ice packs reduce swelling. ColdCure ice packs relieve pain.
. Cold Cure wraps have reusable ice packs. Reuseable gel packs are a better name. Ice packs are actually not as good as cold packs. Our gel packs stay cold and stay in place. There are many reusable icepacks on the market, but none are as good as coldcure for relieving pain and keeping you safe. A reusable ice pack and cold wrap that are stored in the freezer can be dangerous. They can cause the skin to freeze. ColdCure cold wraps don't have that danger. There is only one excellent Cold compression wrap. The best ice pack and cold wrap is the coldcure wrap.